Lessons from a hot head. 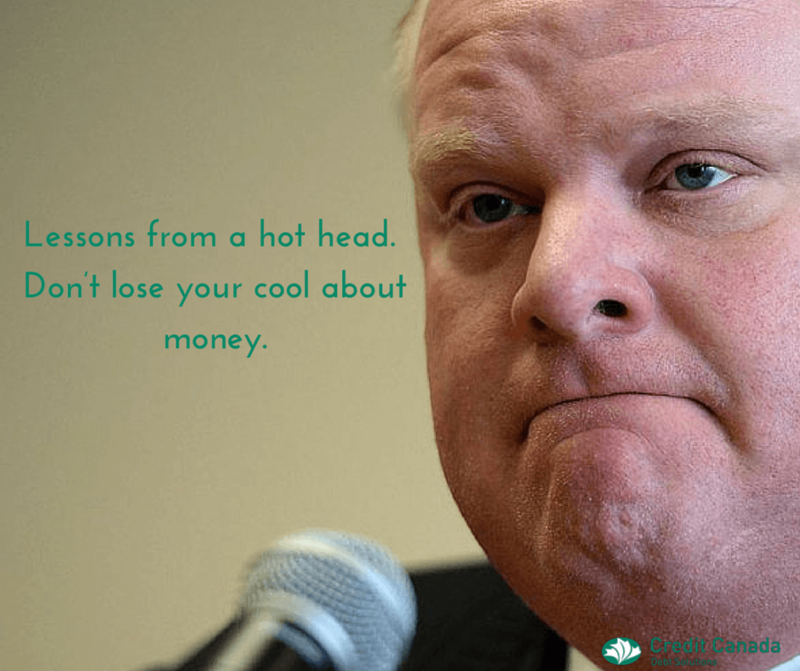 Don’t lose your cool about money. When it comes to anger and money, we’re looking at the good, the bad, and the ugly. Let’s start with the ugly. Most of the civilized world is familiar with the ferocious temper and outlandish behaviour of former Toronto mayor Rob Ford. Videos and news clips of him flying off the handle at various times have circulated globally, making him a strange sort of celebrity superstar and a punching bag for late night talk-show hosts. Today, with a new mayor in place, the dust for the most part has settled around Ford, though specks still float in the air. Lots of Torontonians are relieved that he has been brought down a notch, having been re-elected in 2014 as a ward councillor. At the same time, however, many now feel sympathy for a man who is battling cancer on top of dealing with issues of rage and substance abuse. I’d say many in the city can forgive, but they cannot forget. As a specialist in credit counselling and debt consolidation, I have my own reasons for keeping memories of Rob Ford’s behaviour intact. To me, he is an unforgettable example of those who too often let anger run amok when dealing with issues that involve money. Just look at Ford’s most explosive moments shot on private video or caught by cameramen in news interviews – or attempted interviews amid scuffles – at Toronto City Hall. Invariably, the violent outbursts have had to do with allocations of funds, or the alleged misappropriation of funds, or claims of thievery directed at the former mayor (this charge apparently triggering his astonishing rant in the so-called “crack video”). In an odd way, we perhaps owe Ford some thanks. He has provided us with a cautionary lesson. He has shown us in spades how fury over money-related issues can make a man his own worst enemy. Which brings me from the ugly to the bad in terms of anger and money. Ford is far from alone in letting his emotions get the best of him. It’s fair to say that most of us at some point have lost our cool over finances. The difference between Ford and we voters, though, is that our anger mostly has to do with personal rather than public funds. The anger may fall short of being ugly, but it can be pretty bad. What you have to watch out for is anger that comes from irrational thinking about money. The indignation often is symptomatic of deeper psychological issues stemming from an individual’s experiences with money while growing up. Obviously, exactly what those experiences entail differ from person to person. It’s safe to say, though, that if you find yourself directing anger towards others about the deep debt hole you’ve dug for yourself, or the bad credit score you’ve managed to create, or the blind, bad investment you’ve made, then you’re likely being irrational on the basis of psychological issues that remain unresolved. The anger you’re projecting outwardly really ought to be directed only at yourself, for in all these cases it’s you who got yourself into a pickle. And now that’s my cue to talk about the good in relation to anger and money. You should know that anger over financial matters also can be a positive thing if it’s approached with reason. That is to say, it’s okay to get angry about your problem debt, your bad credit score, or your dumb investment provided you direct the anger at the one who’s really responsible for the screw ups. The trick then is to use the energy of that anger to calmly take command of the situation, take full responsibility for your behaviour, and take what steps are necessary to improve your lot in life. A lot of irrational anger about money comes from denial and self-deception. The solution is to look within and be honest with yourself and with others. In cases where anger about money is a constant, it’s imperative that you seek professional counselling or therapy. Solutions might very well come through the credit counselling and debt consolidation programs we offer at Credit Canada.